5 Way Wire Crimper 240mm / 9.5"
Rolson 5 Function - Wire cutter, Wire Stripper, Bolt Cutter, Crimps Insulation Terminal & Crimps No.. Pro'sKit Tool Modular Crimping Tool. 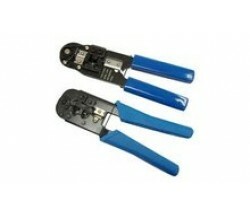 Multi-Function telephone toll crimps, cuts & strips for easy ..
Soldering free pressing in one operation. For insulated & non-insulated end sleeves Pressing 0.5 -..
CT Brand For insulated terminals..